There are many statistics regarding depression, some of which directly regarding women. Due to the increased likelihood of women suffering from depression over men, it is important for women to protect themselves from common risk factors. Read on to discover how depression affects women. Numerous statistics suggest that women are twice as likely to suffer from depression as men. Up to 29% of women are treated for a mental health condition as opposed to just 17% of men. In 1990, approximately 70% of the prescriptions for antidepressants were given to women, and current statistics also show a gender gap. However, while this can be due to a gender gap in affliction, it could equally be a reflection of men being less willing to seek professional help for mental illness. According to the official data, women are two times more likely than men to suffer from major depression. Although it is possible for depression to occur at any age, in women, it is most common between the ages of 40 and 59. This is often attributed to hormonal fluctuations during menopause and an emotional response to menopausal symptoms and fears about aging. However, statistics also show that puberty is another risk period for depression occurrence. After puberty, depression rates are higher in females than in males. This depression gender gap lasts until after menopause. Many socioeconomic risk factors - such as racial discrimination, lower educational and income levels, and unemployment - mean that non-Caucasian women are more likely to develop depression than Caucasian women. The National Center for Statistics asserted that, in 1994, Asian American women over 65 years of age have the highest suicide rate. This pattern also seemed to occur with younger women; Asian American adolescents are far more likely to have depression than other their peers from other ethnic groups. Marriage seems to provide emotional protection for men, but not women. Women in an unhappy marriage are three times more likely to suffer from depression than men in the same situation. 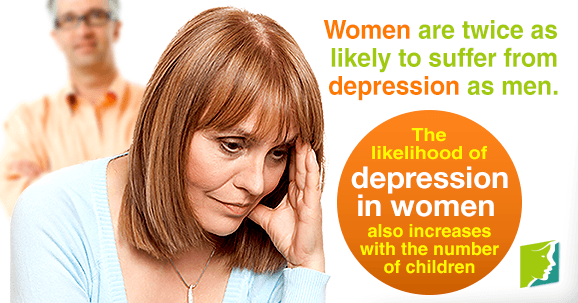 The likelihood of depression in women also increases with the number of children in the house. This could reflect higher demands on women to be nurturers, homemakers, and workers. Although statistics about depression do not give reasons as to why there is such a gender gap with regards to depression, it is thought that part of the reason could be that women are much more likely to live in poverty than men. Financial stressors and less earning potential can contribute to the sense of hopelessness that is often a precursor to depression. Another reason is that women are more likely than men to experience or have experienced sexual abuse, and this can have serious consequences on mental health. Statistics about depression over the past twenty years all point towards a gender gap, but also show that there are age and race-related factors that contribute to depression, too. These statistics suggest that certain lifestyle factors could be to blame for the onset of depression, not all of which can be individually controlled. Can Horse Riding Help Combat Menopausal Depression? Women are more likely to suffer from depression during menopause than at any other time in their lives.